British Columbia’s coastal rainforests are highly productive. This is largely due to a warm, wet maritime climate and steady source of marine-based nitrogen that is transferred to the land from fish like salmon that swim upriver to spawn. The fish are then eaten by bears, and their carcasses are left on the forest floor. They eventually deteriorate and enrich the soil. This is a place of exceptional biological richness. The landscape is an intricate mosaic of intact coastal temperate rainforest islands, inlets, valleys, marine waters, estuaries and freshwater systems. The coast forest region is one of the last true wilderness regions of the planet where intact natural systems function at a large scale. The coastal temperate rainforests found here are globally rare. They occur on less than one-fifth of one percent of the Earth’s surface. These majestic forests are famous for trees of giant proportions. They contain more living biomass per acre than any other ecosystem in the world. 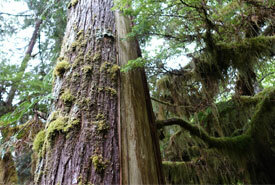 Characteristic species are western hemlock, Douglas-fir, western red cedar and Sitka spruce. In the British Columbia Region, the coastal forest region is a target for the Nature Conservancy of Canada's (NCC’s) conservation work. NCC has conserved forest in the Central Coast and Haida Gwaii, in addition to the Clayoquot Sound and Squamish Corridor areas. NCC’s land management planning emphasizes working in partnership with First Nations (Haida, Heiltsuk, Wuikinuxv), scientific research institutions and education programs. Together, the partners work to ensure the most effective conservation of these forests and their natural values. In 2016, NCC protected the Gullchucks Estuary with support from the Government of Canada and TD Forests. In 2016, NCC protected the Rivers Inlet and Spider Island with support from TD Forests.